Eating healthy has never been so easy or so good. 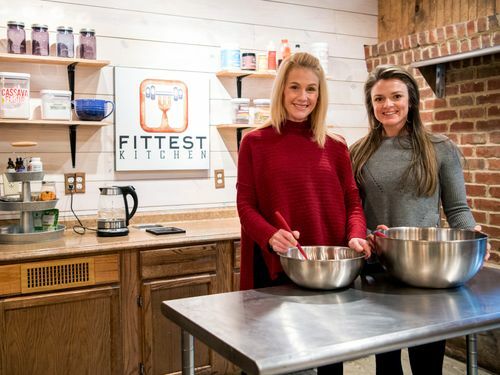 Fittest Kitchen creates recipes and prepares meals with your health in mind. Our recipes are healthy, simple and budget friendly. You can find the perfect recipe online or order prepared meals for the week ahead. Fittest Kitchen is your go-to for eating great all the time. Order meals online each week between Wednesday at 7am until Thursday at midnight. Pick up your meals Monday between 2pm and 7:30pm in The Fittest Kitchen at The Health Factory. Pick a subscription plan that suits your style. Stock your kitchen with the Fittest Kitchen Staples. Pick your favorite recipe from the recipe database. Start cooking like a gourmet chef! I always thought losing weight meant you had to restrict the amount of food you ate. My body was hungry! It needed food!! Once I started eating more and getting the proper amounts of protein, fat, & carbohydrates, the weight started slowly coming off! My coach has helped me become more comfortable with food and using it as fuel and not punishment. Although I came from an athletic background, I had become increasingly sedentary and my diet was out of control, which was causing me to steadily gain weight. At first, I could tell the daily exercise was helping my overall health, but I wasn't completely satisfied with my fitness level. I would spend one hour working hard in the gym, only to sabotage my progress with a bad diet throughout the rest of the day. I was trying, unsuccessfully, to out-train my unhealthy lifestyle. One hour of discipline a day just wasn’t going to cut it. Eventually I realized that I should put the same effort into my lifestyle that I put into my workouts. I sought nutrition advice from Coach Dusty and followed his instructions. At first it wasn’t easy, but I trusted my coach and stuck to it. I started to learn how to view food as it affected my overall health and performance. Over time, the process became easier and I started to see significant results. My body fat dropped, and I gained lean muscle. Best of all, my workouts were better than ever before. I never realized how great a workout could feel when your body is properly fueled to perform. At 28, I’m the healthiest I’ve ever been, and I can’t wait to see where I go from here! A delicious, healthy lifestyle is within your reach. Subscribe today to start eating amazing food that makes you feel wonderful.